147th Grey Overseas Battalion C.E.F. Height 5ft 5 ½ in. R M Kerr Officer in charge of Discharge Depot. Place and Date Camp Borden Ont. August 31st 1916. N.B. 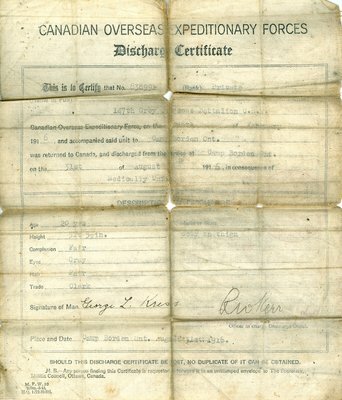 – Any person finding this Certificate is requested to forward it in an unstamped envelope to The Secretary Militia Council, Ottawa, Canada.